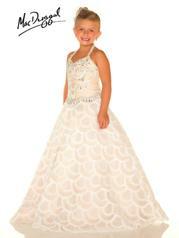 Have your little girl standout in this elegant pagent gown! She will feel like such a princess, that she'll never want to take it off! This Ivory pagaent dress with stone and crystal embelished bodice and mesh overlay skirt will make every girl want to wear it.